Here’s a map of dino tracks, made by an Anomoepus. It was an Early Jurassic omnivore (ate plants and animals) but it had feet like those of early meat-eaters’. Run your finger around the tracks. Most of the time the Anomoepus was walking on its toes with the ankle way off the ground, the way a bird walks. Sometimes it was walking slowly, so the tracks are close together. But it sped up in a few places – can you see where? There’s one place where the dino sat down to rest. You can see the imprint of the big tendon that was on the back of the shin and ankle (called the “Achilles tendon”). And you can see the hand-prints also. The Anomoepus hand was a very primitive dino hand, with five fingers. Can you see where the critter squatted down on all fours? 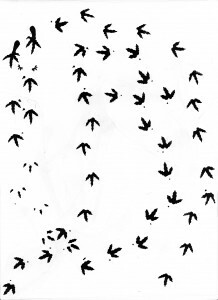 Tracks like these prove that dinos walked like birds and hardly ever jumped like a kangaroo. My guess is that Anomoepus was an Early Jurassic Therizinosaur or Primitive Ornithomimid, somewhere in the transition period between diets or this could also prove that other theropods (namely Coelurosaurs, that is, if Ornithomimids ARE Coelurosaurs like the Tyrannosauridae.) shared a common ancestor but branched off from there. In other words, Ornithomimids have a separate lineage than other theropoda and Coelurosaur. Anywho, that’s my comment Dr. Bakker. By the Way, you ARE right about the fact the tracks show a bird-like gait and that they could indeed help prove that some smaller theropods are on the same lineage to birds…as well as some DNA extracted from a T. rex fossil, giving us more evidence to prove that smaller theropods (those that do not reach the size of Carnosauria or large Late Cretaceous Coelurosaurs, namely the Tyrannosauridae.) Too bad, I was a little late for this post.